I kept looking at this block and it just didn't feel right to me. At last, I realized that what was bothering me was that central pale yellow block. It just looked too square and even in a series of blocks that had nothing square and even about them. As you can see on the right, I made some minor changes. 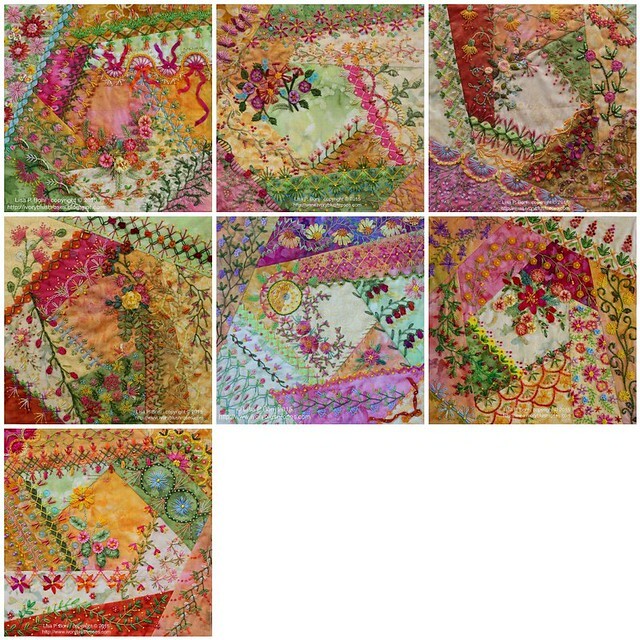 This is a composite of all the blocks before I made any changes to the July Block. That pale yellow square (even though it's really a hexagon, it reads square to me because of that right angle of the embroidered stems) just jumps out, demanding attention. That would have been fine if I wanted it to be the commanding center of attention, but I didn't. To make the block come in line with the rest of the blocks, I added more of the little vines and french knots to bring the block out of square and more into a random shape like the other blocks. It was a very simple change, but it makes the block SO much better!!! Now when you look at it, that pale yellow block doesn't demand nearly as much attention and provides a much better balance with the rest of the blocks! I'm much happier with it now! Now I just need to address the "bullseye" affect of the mandalla motif. The rest of the blocks flow very well, but this one still has a few issues. And I also see a bare sport that needs dealt with on the May block as well. Looking at the composite, I see that with the remaining blocks, I need to vary the orientation a little bit more to help the entire piece flow better. I don't want the underlying pattern of the blocks to be quite so noticeable, but rather to have a slightly more random appearance. 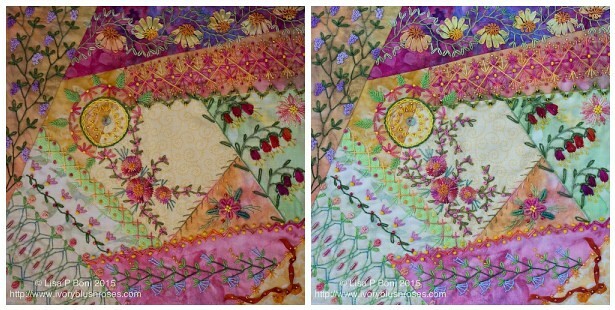 I've also been looking at possible fabrics to use as sashing between the blocks. 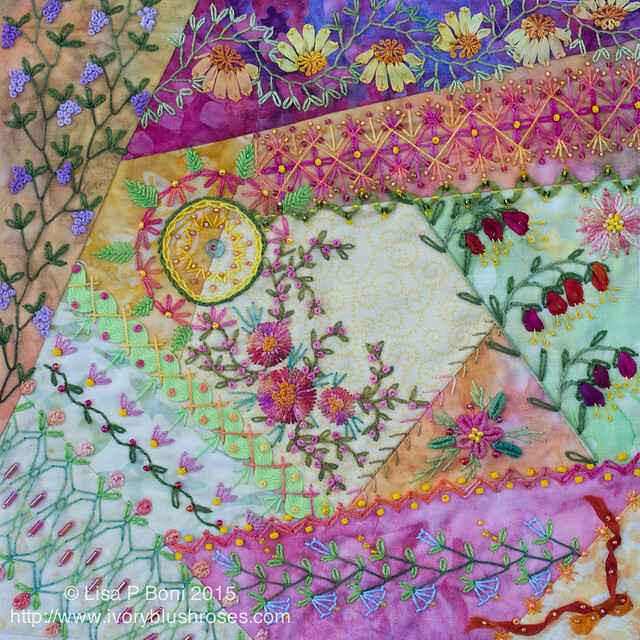 The more I look though, the more I think that there won't be sashing between them, but maybe a narrow two or three toned border. Five more blocks to finish though, before I can truly focus on that part of this project! I love what you did and it does make the block look better. It is amazing what a little 'change' can do. Your work is always lovely, so well done. Thank you for your blog! The eye candy has kept me sane this last month. I understand your dilemma with the blocks. When pictured together I saw 3 or so blocks with very light centers that I felt stuck out. Maybe more stitching in the lights would solve your problem, not high contrasts but low. Just enough to kill the brightness. On the mandala, just pull out the green stitching and it loses the circle look. These are just observations, not criticisms. As to sashings, a friend of mine chose grosgrain ribbon about 3/4" wide, and it turned out terrific. These blocks are JOY JOY JOY! I love it! The details, the color, the designs are just perfect! You are amazing!